Saturday, September 27 - our first full day on the James Bay coast. The morning was relatively warm and by noon the temperatures were well over 20 degrees. That meant that if the birding was slow, there would always be dragonflies and butterflies to look for. We watched the bay for a few hours throughout the morning and added new trip birds in Red-throated Loon, Pectoral Sandpiper, and our first migrating Rough-legged Hawks. The seawatching was pretty slow however, and after several hours Jeremy, Kory and I decided to walk along the edge of the spruces to the west to look for songbirds. In a flock of American Tree Sparrows I noticed a Magnolia Warbler - relatively late for this species up here. It quickly continued on to the east, foraging in the alders. Later, after watching several Nelson's Sparrows, Jeremy locked on to a Clay-colored Sparrow which we tried to hunt down for photos (I failed). Suddenly we heard yelling from back at the shelter. It was tough to make out what Alan was yelling, but we thought we heard him say "Gannet". Needless to say we sprinted to the coast! After scanning the bay and seeing the large black and white seabird lumbering east, I ran to the shelter to watch the bird in my scope. For the next 30 seconds or so we observed the bird as it steadily made its way east. It was not far off shore, but the tide was rather low unfortunately. While it afforded a good look zoomed to 60x in the scope, it was too far for decent photos. I tried anyways but my lens was fogged up as the camera was sitting on the ground...lesson learned! Most Northern Gannets seen in Ontario are juveniles that probably make their way up the St. Lawrence River into Lake Ontario. As of the end of 2013 there were 46 accepted records for Ontario - only 4 of these pertain to adults. 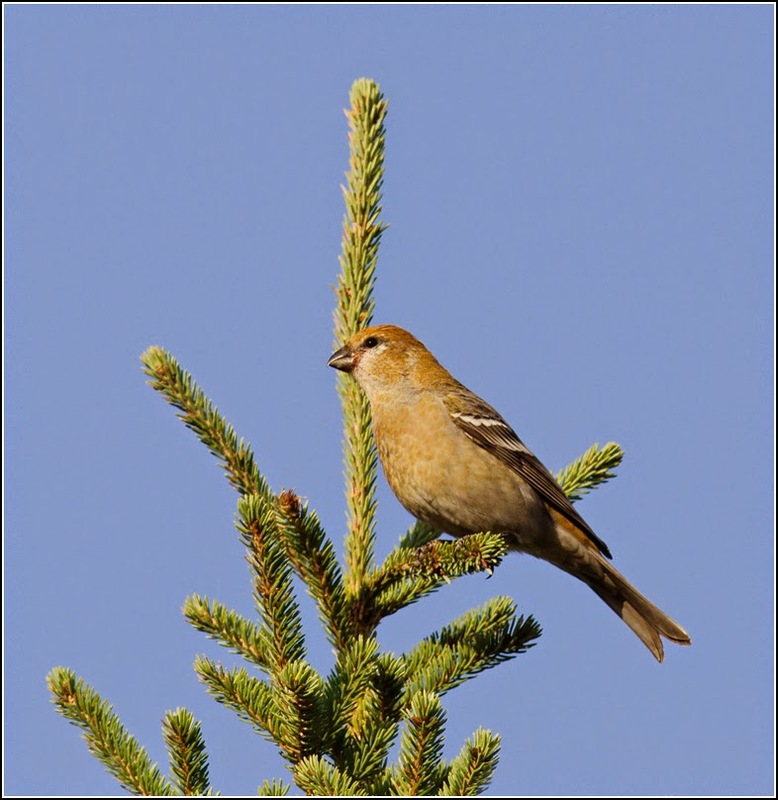 As we sat by the coast later in the morning a few Pine Grosbeaks called and eventually landed in the spruces behind us. They fed on the cones for several minutes, allowing us great looks and decent photos, though at a bit of a steep angle. 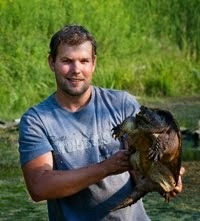 This was a lifer for Jeremy and the first Ontario ones for Kory. These weren't the only new finch for the trip - small flocks of White-winged Crossbills and Common Redpolls made sporadic flybys. When the seabird action is slow, there are always raptors to look at as they cruise by the flats, searching for Horned Larks, sparrows, or even shorebirds. 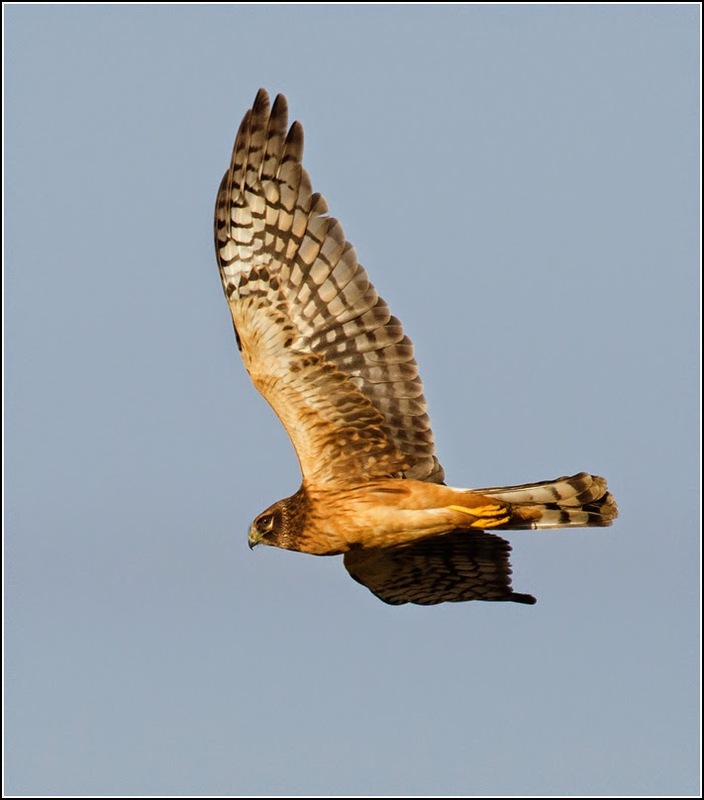 Peregrine Falcons disappear as quickly as they arrive in some high-speed pursuit of a wayward Dunlin or Lapland Longspur - but Northern Harriers tended to hang around as they slowly and methodically searched each patch of beach grass. We lucked out on several occasions throughout the trip and watched one successfully nab a sparrow. More often than not they were unsuccessful, but with enough attempts I'm sure they catch their share. 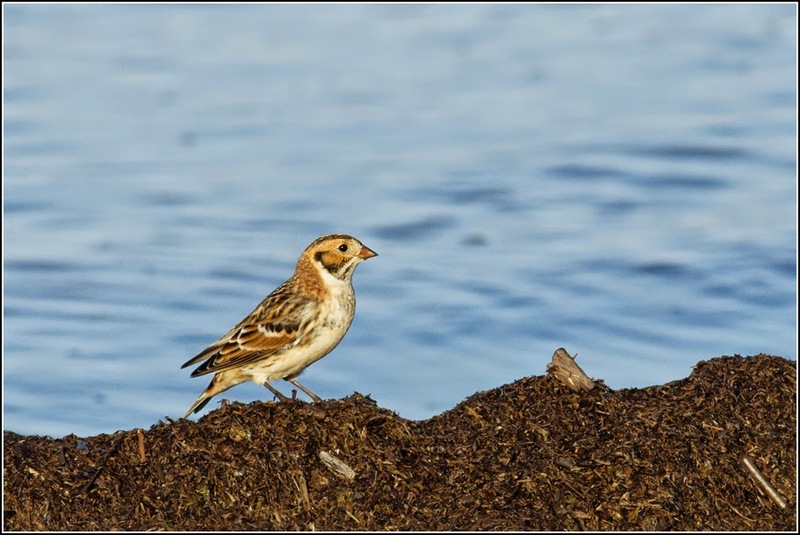 Speaking of longpsurs - most southern Ontario birders think of Lapland Longspurs as birds that occasionally travel with Snow Bunting flocks in the winter, or as small flocks seen briefly during April or the autumn. At Netitishi they are a common staple. If I had to place a wager on which songbird I heard vocalize the most on this trip, Lapland Longspur would certainly be in the consideration, along with Boreal Chickadee, Horned Lark, White-winged Crossbill, and Common Redpoll.. Usually at least one large flock of 50 or 100 Laplands would be in the beach grass and drfitwood, between the spruces and the bay. This one was foraging along the edge of the tidal wrack near the very point itself. Later that afternoon Kory, Jeremy and I ventured east to see what was around in the meadows around the point. 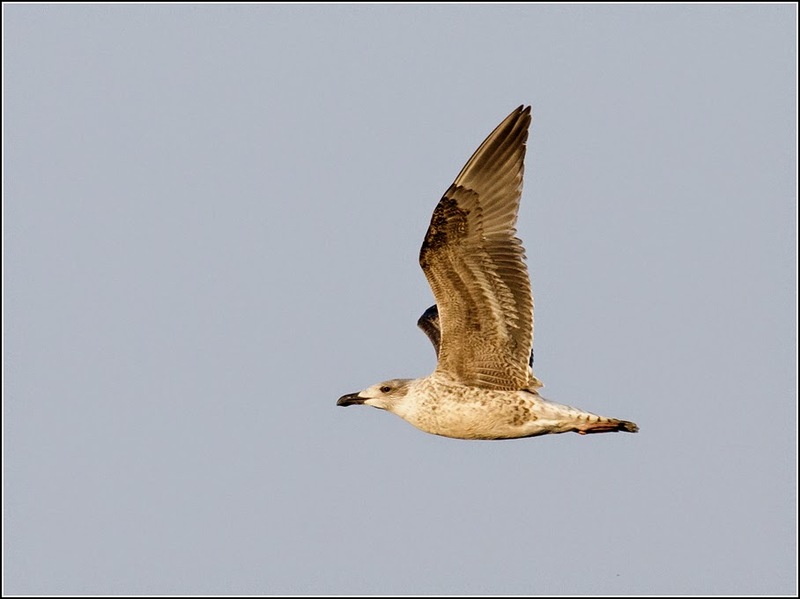 Other than the above longspur, I grabbed some shots of the first Great Black-backed Gull for the trip as it cruised over the flats, heading west. 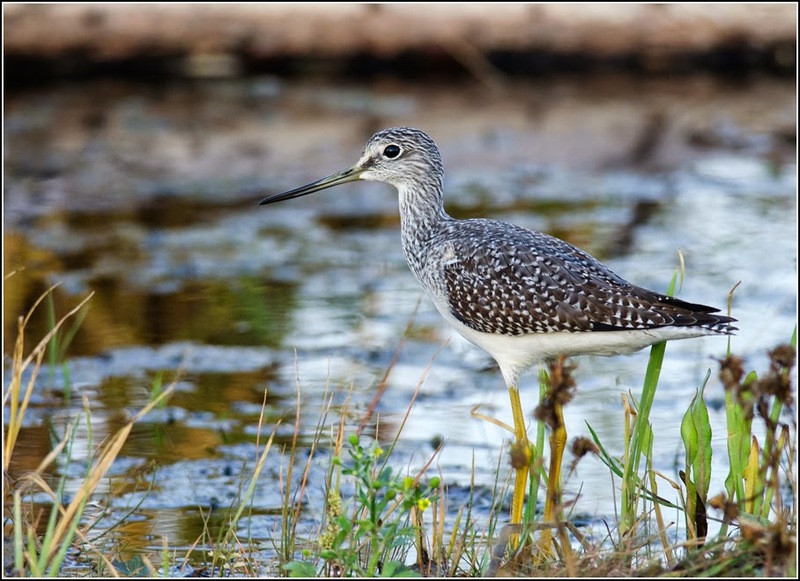 While most shorebirds stay on the flats, this Greater Yellowlegs was in a pool close to the shoreline. 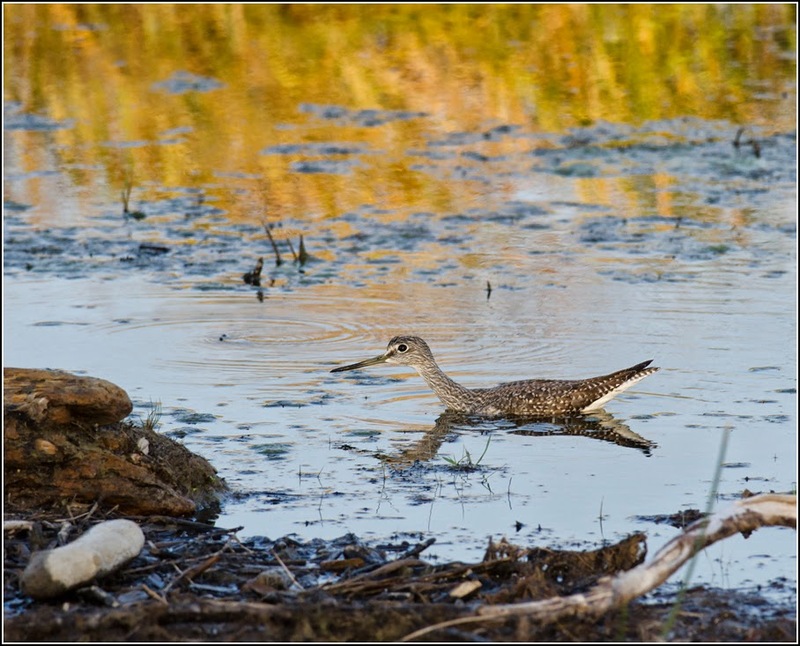 The lighting was nice and we were able to approach the bird closely for some photos. At one point a distant soaring Peregrine Falcon caught its attention and it lowered itself into the shallow water with its head down until the danger passed. By dusk it was still hot out with a southwest wind. That evening we could only imagine the possibilities of rare songbirds that were en route, and dream of maybe crossing paths with some of them in the upcoming days. At the very least, the potential of knowing what could arrive would provide us with motivation to search through the sparrow flocks on those slow seawatching days.